Our round and square 46" tables have weatherproof thermoplastic coating to provide years of attractive usage. Black powder coated galvanized steel 2" tubular understructure. 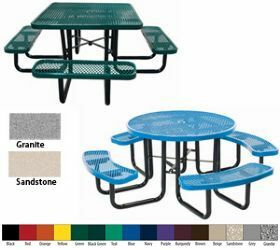 Choose from 16 colors - Black, Red, Orange, Yellow, Green, Black Green, Teal, Blue, Navy, Purple, Burgundy, Brown, Beige, Sandstone, Grey & Granite - please specify when ordering. ADA tables available. FOB Shipping Point.